Yusuf was born in 1948 in Eyl, situated in northeastern Somalia. He is a Juris Doctor (Somali National University) and holds a Ph.D. in international law from the Graduate Institute of International Studies of Geneva. Prior to his doctorate, Yusuf completed post-graduate studies in international law at the University of Florence in Italy. 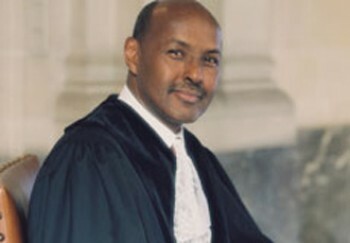 Yusuf’s previous positions include: Legal Adviser and Director of the Office of International Standards and Legal Affairs for UNESCO from March 2001 to January 2009, Legal Advisor (1994–1998) and Assistant Director General for African Affairs, United Nations Industrial Development Organization (UNIDO), Vienna (1998–2001), Representative and Head of the New York office of the United Nations Conference on Trade and Development (UNCTAD) (1992–1994) and Chief of the Legal Policies Service of UNCTAD( 1987–1992), Lecturer in law at the Somali National University (1974–1981) and at the University of Geneva(1981–1983), and Somali delegate to the Third United Nations Conference on the Law of the Sea (1975–1980). He has also been guest professor and lecturer at a number of universities and institutes in Switzerland, Italy, Greece and France. Yusuf is the founder and General Editor of the African Yearbook of International Law and is a Member of the Institut de droit international (Geneva). He is also one of the founders of the African Foundation for International Law, as well as the chairperson of its Executive Committee. In addition, Yusuf has authored several books and numerous articles on various aspects of international law as well as articles and op-ed pieces in newspapers on current Northeast African and Somali affairs. On February 6, 2009, was appointed as a judge at the International Court of Justice. On February 6, 2015 he was elected vice-president of the court. In 2011, Yusuf would later gain a seat in the advisory council of The Hague Institute for Global Justice.